I admit the verses from 1 Timothy can be hard to take in, given the current realities at work in our country. While Paul is encouraging Timothy to wage the good warfare, often our conflicts and battles on social networking, in our congregations, families, and in our communities leave us feeling ready to walk away. 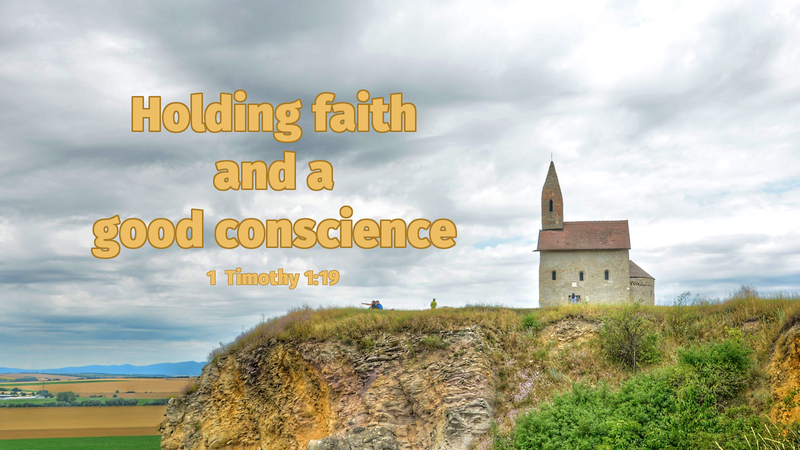 Paul states something worth holding onto: “holding faith and a good conscience” and that “by rejecting this some have made a shipwreck of their faith.” Holding onto faith and a good conscience changes our interactions with others. Sure, we will have our disagreements and battles, but standing on faith and a good conscience can give us the courage to face even the most troublesome days. Beyond this what else does Paul offer? Paul states, “I urge that supplications, prayers, intercessions, and thanksgivings be made for all people.” It is my prayer that, as God’s people, we can willingly offer prayers without ceasing, to lift up elected officials, and hold fast to faith and conscience as we do justice, love kindness, and walk humbly with God. Prayer: Holy Spirit, give us the faith to hold fast in times of challenge, retaining that good conscience you have blessed us with. Amen. Today’s devotion was written by Kris Snyder, Pastor of Gonvick Lutheran Parish, Gonvick, MN.